THE GIRL GEORGE LEFT BEHIND! I knew all the Beatles in the days before they became famous. I went everywhere they performed, just to see and listen to them. But George was the particular love of my life. I used to beg, borrow and steal pictures of him for my secret collection... Well, it's over now - for me. George is married - and I'm just a friend from the past. But I shall never forget the boy he used to be, before the fame overtook the Beatles. YOUR STORY could be my story; your dreams could be my dreams... once upon a time. But that's a long time ago. (Is it really five years?) I was fifteen when I first met the Beatles in the Cavern in Liverpool. I used to play hookey from school and go there with my girl friend for the lunchtime sessions. We didn't dance. We just went to listen to the groups and to stare at the boys as they played. Heaven knows what the good nuns would have said if they had known where some of the girls were spending their time instead of eating their lunches. We used to stay so long in the Cavern that it would be too late to go back for afternoon classes. Then we'd have to go to school the next day with little notes (that we wrote ourselves) saying we'd been taken suddenly ill after lunch. I'll never know how we got away with it, but I don't remember anyone being caught. This was in 1967 and the Beatles were hardly known outside of Liverpool. But at the Cavern, they were a real sensation. George was always the one I fancied. My friend Marjorie had a thing about John. We were the most devoted fans the boys had. We went everywhere they played. Sometimes there would be an all-night dance session at the Cavern, and we'd tell fibs to our parents in order to get there. I'd say I was staying the night with Marjorie, and she'd tell her mother that she was staying with me. When I was caught, my mother used to make me stay home for several nights as a punishment. "You're Beatle mad," she used to scold me. "I can't understand what you see in those boys!" But when the Beatles became famous and made a triumphant return to Liverpool from London, Mum changed her tune. She was quite proud of them then. "Nice boys!" she told everyone. "They're a real credit to Liverpool." I must tell you what happened when the Beatles returned. For the first time, I really broke my heart. A great procession moved through the streets, with the Beatles in the first car and an immense cavalcade of cars following it. Mum and I stood on a corner of our street, trying to catch a glimpse of the boys as they went by. Everyone was cheering. Then suddenly, I realized that the car with the Beatles in it was opposite us. Paul was waving to people from the window. All at once he caught sight of me. I saw him tug at the sleeves of the other boys, to make them look at me. He was sort of jiggling up and down. I just couldn't help myself. I burst into tears and nearly got pushed under the wheels of the car behind the Beatles, in which George's Mum and Dad were riding. How can I explain why my heart felt as if it was breaking? You see, I knew then that the Beatles weren't my Beatles anymore. They'd grown away form Liverpool. They belonged to London - and the whole of England. That's why I cried so bitterly. It's like the night the Beatles go their first big offer from London. They were playing at the Cavern, as usual. Bob Wooller, the disc jockey there, went to the mike and announced that the boys had hit the top of the charts with PLEASE PLEASE ME. I think he expected everyone to cheer. If he did, he must have been sorely disappointed. Instead of cheering, all the girls burst into floods of tears. They didn't want the Beatles to be famous. They wanted to keep them in Liverpool! That's how it is when you're a fan with a big crush on someone. You're scared all the time that someone else is going to take them away from you. For years, I had a gigantic crush on George. My greatest thrill was exchanging a few words with him in the Cavern when he wasn't playing. We girls used to hang 'round the band room there - it was a really tatty little room - hoping to catch a glimpse of our favorites. Then the bouncer would come along and turn us all out. I laugh when I think about it now, but we actually tried to make the Beatles jealous by pretending to ignore them and talking to other boys. I don't suppose we ever succeeded! When I first got to know George, he was still an apprentice electrician. Later, he gave up his job to play full time. I was so crazy about him that, when I went to technical school to study millinery, I made him a hat. It was a sort of suede cap, really. He wore it very loyally till it fell apart. I was never George's sweetheart. We were just good friends. In fact, I was friends with all the boys. We'd go to movies together, and things like that. Even in those days the Beatles had their distinct personalities. John was always the one who, if he had an idea, would stick to it through thick and thin. Paul was always the debonair one. George, the one I adored, was just nice and simple and a little bit dozy in the way he never seemed to be listening to what you were saying. I don't think that I ever dreamed the Beatles would be famous one day, but they often talked about what they would do if they got money. George, who was very fond of sleeping, said that he'd like a huge electric bed in which to ride 'round the town, so that he'd never have to get up. Paul's ambition was to have a super smoking jacket: something in velvet. And John said he'd like to have a harem! I knew Ringo very much less than the others because he was still the drummer with Rory Storm. He looked much better with his beard. It's a shame they made him shave it off. 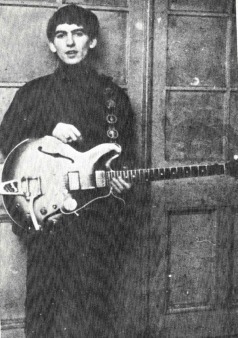 Pete Best was the Beatles' drummer in those days, and when the boys wrote their number, P.S. I Love You, the girls used to twist the words and sing: Pete Best, I love you! Oh well, it was all a long time ago, and all I've got are my memories and my photographs. Most of the pictures you see here - in fact, all of them - were taken by Paul's brother, Mike. In those days, Mike was an apprentice hairdresser, and sometimes he used to cut the boys' hair for them. George was the only member of the group who wore his hair long, really long. Everytime Mike took a picture of George, I would pester him till he gave me a print for my collection. I kept a scrapbook of clippings, too. I spent a fortune on magazines. Anything that carried a line mentioning the boys, I cut out and pasted into my book. There isn't a dramatic end to my story. As soon as fame came to the Beatles, I saw less and less of them. After a long interval, they came back to play at a theatre in Liverpool. I bumped into George on the street, and we had a pleasant chat. It wasn't the last time I saw George. I met him later at the theatre, with Pattie Boyd. I knew she had accompanied him to Liverpool and I went prepared to hate her, but when he introduced me to her, I just couldn't help liking her. 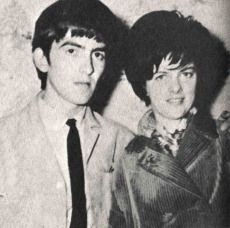 I wish George and Pattie - and John, Paul, and Ringo - all the luck in the world. But I wish, too, that it all didn't have to change - that I could still be a schoolgirl playing hookey from classes and running off to the Cavern to see and listen to the Beatles long before they became famous and left Liverpool to become teen idols all over the world.